Home Traditional Homes The 1950’s Time Capsule Home! This home might look ordinary on the outside, just like the rest of the houses in its neighbourhood, but its interior is an altogether different story… Step inside it and be transported back in time! If some houses today are designed to emulate the 1950’s era, well, this home IS the 1950’s! It’s a time capsule, a time machine! You can easily forget that you’re living in the 21st century when inside this home in Bloor West Village, Toronto, Canada. Not simply because it was designed with a 1950’s theme but because it was lovingly maintained by its original owner for 72 years! When you step inside, you’ll immediately notice that the entire home features soft colours – a design element common in the 1950’s all the way to 1980’s. You’ll see rooms of pink, seafoam, purple and aqua which are the homeowner’s favourite colours. The last and probably the only major overhaul done to this house was back in 1965. Some of its furniture and appliances date back even earlier. For instance, the stove that you’ll see in the kitchen is a Moffat 1950’s original and it’s still in perfect working condition! Aside from the kitchen (which by the way includes a classic breakfast nook), its dining room and basement adult living area also make the perfect 1960’s to 1980’s movie set. 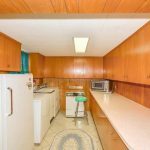 And while we’re all dreaming of an extra space that’s just enough for a washing machine, this house boasts of a proper, fully-equipped laundry area! This 2-storey detached home was listed in 2014 at $699,000 as the 96-year-old owner decided to move to a retirement community. Of course, as expected, the listing is no longer available. We know… and just like you, we wish we had seen this way earlier! But for now, you can appreciate the beauty of this lovely home by viewing our gallery below! Next articleDom’Up Treehouse – taking glamping to a higher level!